After being announced earlier this year, the Eve Energy Strip is now available to purchase for $99.95 through select retailers such as Amazon and Best Buy. The Eve Energy Strip has a trio of outlets, each with their own power button and the ability to be controlled via HomeKit from any of your Apple devices. The Eve Energy Strip has overcurrent, overvoltage, and surge protection built in. 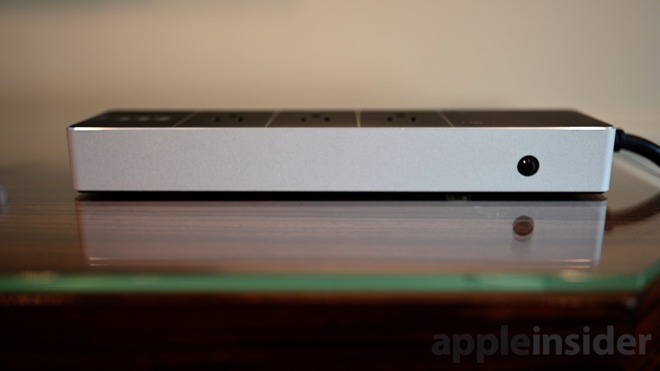 AppleInsider went hands-on with the Eve Energy Strip during the 2019 Consumer Electronics Show and was impressed with the build quality and design of such a useful product. Eve Energy Strip is controlled via Wi-Fi, has complete data privacy with nothing being sent to outside servers, and supports HomeKit exclusively. You can schedule your devices to turn on/off at specific times, automate them based on your location or motion sensors, and much more. Thanks to the internal monitors, you are able to view how much electricity is being consumed by your devices and even estimate costs based on your location. AppleInsider will have a full review soon, so be sure to stay tuned for further coverage.